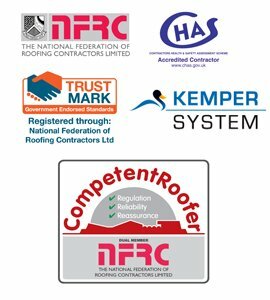 Our company was formed over 38 years ago, based in Staffordshire, and has continuously carried out various types of roofing work, having vast experience in providing a high quality of workmanship to Central Government Departments, Local Authorities, Schools, Construction Companies, Businesses and Private Individuals within Staffordshire, the Midlands, Cannock, and Walsall. As a long-standing reputable company we aim to give both large and small contracts our personal attention, and time, to ensure all works are done to the highest standard. We specialise in industrial, domestic and commercial roofing refurbishment, carrying out all disciplines within the industry, including sheeting, cladding, tiling and felting, utilizing our fully trained operatives. All new works carried out by G. Cooper Roofing are fully guaranteed material and labor (details available up-on request). We are approved by Langley, Anderson, Kemper and Vulcanite Waterproofing Systems. Our operatives also hold safety certificates that are regularly kept up to date with Health & Safety requirements within the industry. Whether you require small emergency repairs or major contracts we are always willing to respond to any roofing problems. Roofing Midlands, Cannock, Stafford & Walsall by G Cooper Roofers.